Scripting. The ultimate in file management efficiency. Roll your own custom commands, wrap them in an XYplorer Script file (XYS), or a User-Defined Command, and trigger them by just a click or a keystroke. Can't get any better? It can! Share scripts with colleagues, or download them from the internet: Just drop a script file into your app folder and fresh plug-in commands are at your finger tips. This little script backups the current XYplorer.exe to D:\Archives\XY\6.80.0080_2008-02-17. You can assign a keyboard shortcut to it, and/or add it to a drop-down menu with a caption of your choice. Just click and the move will reliably happen. No need to remember long paths anymore, to locate them on your hard disk, to drag 'n' drop or copy 'n' paste. Mass renaming deluxe. This script will prompt you for two strings and then replace one with the other in all currently selected file names. Now tabs can be iconized. Shrunk to the size of an icon. A mind-blowing space saver. Search for folders by size. You want to list all folders bigger than 10 MB? Or all empty folders? A neat listing with all folder sizes calculated and displayed is just a click away. Simply tick "Search for folders as well" on the Info Panel | Find Files | Size tab. 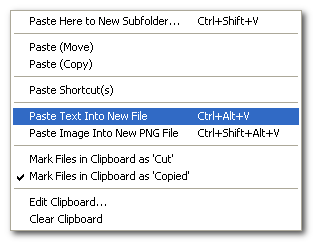 Now you can turn a text or image from clipboard directly into a new file by a single click. Now there's secondary sorting. Simply hold Shift while you click on a column header to sub-sort the file list by this column. New command "Swap Names" (Ctrl+Shift+F2) swaps the names of two selected List items.